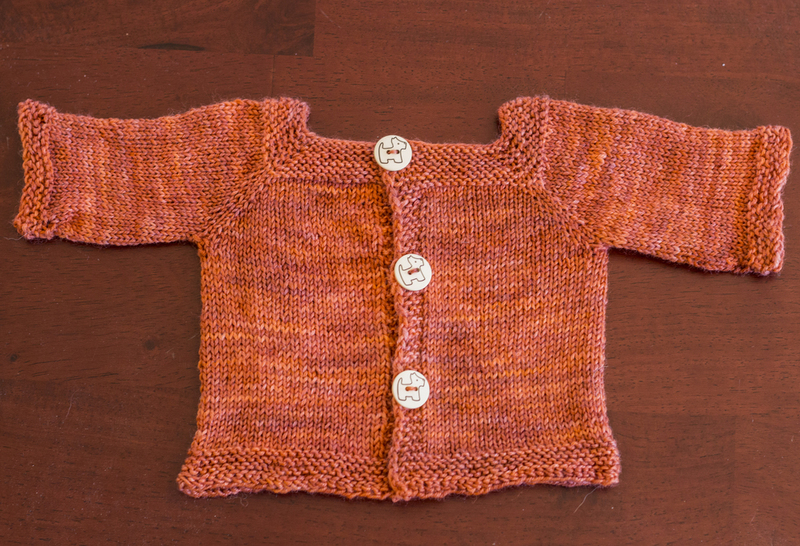 The Jeudi baby sweater by Elisa Di Fiore was chosen as a sample for one skein of Borzoi in Double Dog Dare Ya because of the asymmetrical cabling and back buttoning. The pattern was modeled after the Vendredi sweater, which looks almost identical, with the main difference being Elisa’s version is in English, rather than French. There’s only one size offered, but that can be easily changed with adding stitches to the cast on, or using larger yarn or needles. 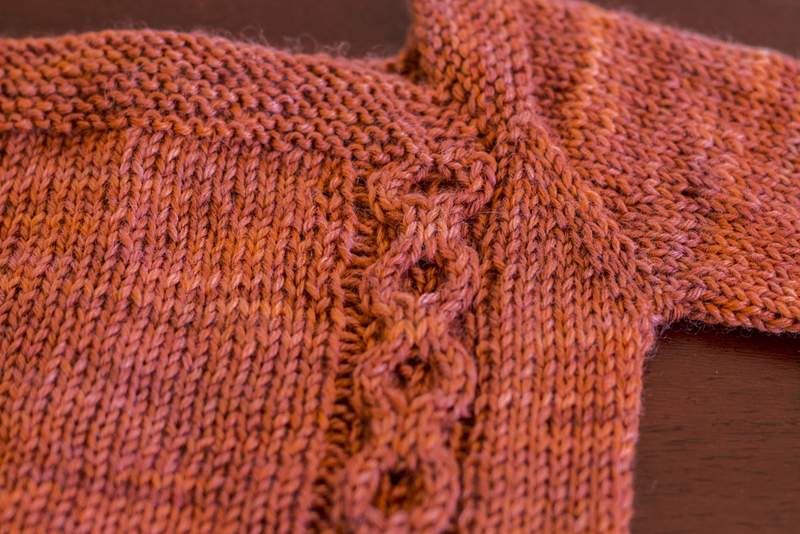 The sleeves are raglan, meaning that they extend in one piece from the collar, and the buttonholes are added as yarn overs, with the buttons being added after blocking. The pattern starts off with a normal cast on, continuing with rows of garter stitch, eventually switching to stockinette and the beginning of the cable pattern. I ran into a few issues with the cable pattern that were not the patterns fault, rather my misreading of it. The cable pattern box starts off with row one and has 8 rows total; I missed where the pattern stated to start on row 2 of the cable pattern, and so I was going for a while with the honeycomb cable showing backwards. It didn’t take particularly long for me to figure out my mistake, and rip back to the garter stitch section. The pattern continues with the same stitches until the end, where there are more rows of garter stitch to match the collar and sleeves. The pattern is beautifully written and Elisa did a great job at recreating the original Vendredi sweater into English. The cable pattern isn’t charted, just written out, but it’s easy enough to quickly memorize. It takes 3 buttons total, and I was able to use some of our new Scottie Buttons to complete the pattern. The pattern is available for free on Ravelry, so go get it! Posted on July 16, 2014 by Caitlyn Faust.